Tunnel is a Faraday shield. When your device is inside Tunnel, nobody can track your location, activate your mic or camera, view your texts, or snoop through your data. You can put your phone, tablet, or other devices inside of Tunnel to guarantee complete privacy. Tunnel is constructed with copper, silver, and nickel conductive shielding to block EMF (electromagnetic frequencies). People now have the ability to send commands to your “off” phone, activating your mic or camera to watch everything you’re doing. They can gather private information from your phone, listen to your conversations, and track your location without your knowledge. 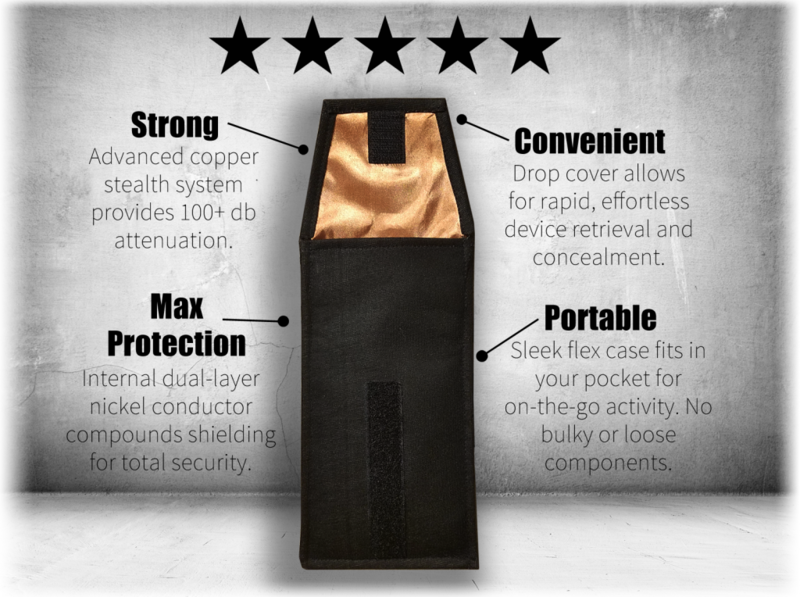 Tunnel creates a complete enclosure inside copper shielding to protect you. It is the only shield on the market that uses a patent-pending dual layer system with copper, reinforced by both nickel and silver conductors. I keep a good supply of these on hand to cover our bases. I make sure every new employee gets one. We live in a world where you can expect to get hit with data breeches, leaks, and sinister new forms of surveillance. They can make or break you in a heartbeat. Staying ready isn’t enough. Being prepared isn’t enough. We have to take relentless action to survive. Tunnel is the most efficient faraday solution out there and it’s why we put it to use at the conference table. I work for a firm where all it takes is one employee’s phone to be hacked and our whole company is at risk. Case in point: a co-worker downloaded what she thought was a “game” on her smartphone. It looked and acted and performed like a real game. Come to find out, the thing was trafficking malicious nasties into her phone which allowed the hackers to get remote access. And she had tons of pics and texts on there. But worse, remote access into her mic and cam could pick up our meetings as she attended. And here we are today… I started using this during private meetings and feel like I can talk about anything without being scooped. And our dept manager just ordered his as well. Awesome product.